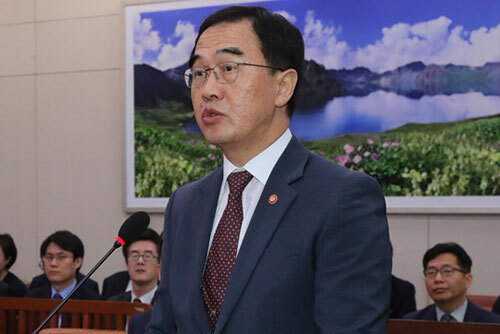 Unification Minister Cho Myoung-gyon has described the inter-Korean joint liaison office that opened Friday as a symbol of peace. Cho made the remark during a speech at a ceremony marking the opening of the communication office in the Gaeseong Industrial Complex in North Korea. Cho said the communications office is a round-the-clock communication channel for the two Koreas, stressing that now, South and North Korea will be able to directly hold consultations 24/7 on advancing their ties and on issues related to establishing peace and prosperity on the Korean Peninsula. Cho expressed hope that the liaison office will serve as the venue for officials and experts of the two Koreas to hold extensive talks on railways, roads and forestry as well as to pursue joint research on ways to implement the declaration that the two sides reached during the summit held on October fourth, 2007. Chairman of North Korea's Committee for Peaceful Reunification Ri Son-gwon also gave a speech at the ceremony during which he said the liaison office is a vein that links the two Koreas in their yearning for peace and unification.